Rising Numbers Of Traffic Fatalities Require Technology Solutions And Prevention Measures Last year, Americans logged more than 3.1 trillion miles and 35,092 people died on the nation's roadways. Now, there's a plan to eliminate traffic fatalities within 30 years. 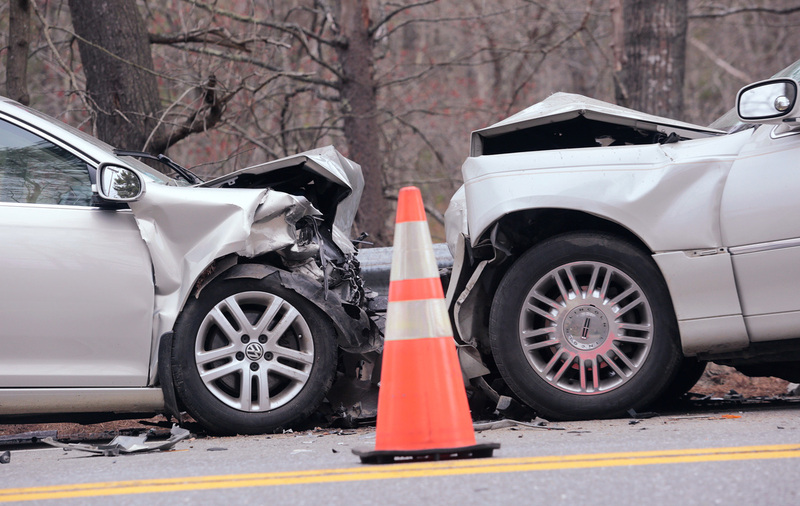 Officials investigate a fatal head-on collision on Route 1 at the town line of Wiscasset and Woolwich in Maine in May. "After decades of progress reducing fatalities, all of a sudden, we're suddenly losing ground," says Mark Rosekind, administrator of the National Highway Traffic Safety Administration. So the government is teaming up with safety advocates, highway designers and others in a new effort to try to reduce the number of traffic fatalities — to zero — within 30 years. "We have an immediate crisis on our hands and we also have a long-term challenge," Rosekind says. The tragic toll is seen every day by accident investigators. "It's an unfortunate thing, but our crash investigators are kept very busy," says Detective Chris Covelli of the Lake County, Ill., Sheriff's Department in Chicago's northern suburbs. Covelli recalls one crash. On May 5, Stephanie Kostenko was walking along U.S. Highway 12 in Chicago's far northwest suburbs. A little after 2:30 a.m. the 22-year-old was hit from behind by a Ford Mustang and killed. "This 23-year-old man [who was driving the Mustang] indicated he was traveling between 65 and 70 miles an hour," says Covelli, a speed that is above the posted speed limit of 55 mph. Additionally, investigators learned the man had been drinking and smoking weed. "So we had three separate things here playing a factor," Covelli says. "We had excessive speed, we had cannabis in this 23-year-old's system, and we had alcohol in this 23-year-old's system." Covelli says all three factors in the crash were completely preventable. "One of the hardest things we ever have to do is go knock on a door at 2 or 3, 4 o'clock in the morning and tell somebody that their loved one has died as a result of a tragic crash, especially when it's a crash that could have been prevented by not drinking, prevented by not using a cellphone, prevented by not consuming alcohol," he says. Yet traffic fatalities from preventable causes are on the rise all across the U.S.
Last year, 35,092 people died on the nation's roadways, according to the National Highway Traffic Safety Administration, an increase of 7.2 percent compared to 2014. The trend continues this year, with NHTSA estimating 17,775 traffic fatalities in the first six month of 2016. That's up 10.4 percent compared to the 16,100 killed on roads in the same period last year. Some of the rise in traffic accidents and in fatalities is due to the fact that more people are driving more often. Fueled in part by a stronger economy and low gasoline prices, Americans drove a record of more than 3.1 trillion miles last year, up more than 3 percent compared to 2014, according to the Federal Highway Administration. And the number of vehicle miles traveled is up 3.3 percent so far this year, on pace to set another record. But Rosekind points out that more vehicles on the road, as well as increased numbers of pedestrians and bicyclists, account for only about half of the sharp increase in traffic fatalities, the vast majority of which he says could be prevented by wearing seat belts, slowing down and putting down the phone. "Ninety-four percent of crashes can be tied back to a human choice or error. Ninety-four percent!" Rosekind says. "Those are the decisions like drinking and driving, speeding or distraction behind the wheel." Rosekind notes that this is happening at a time when air bags, traction control, stability control and other new technologies are making our vehicles much safer. If we had 14 plane crashes a week, our hair would be on fire and no one would set foot on an airplane. Why do we accept the fatalities that occur on our roadways? "We are in the midst of a public health crisis and it isn't Zika," says Deborah Hersman, former chairman of the National Transportation Safety Board and now president and CEO of the National Safety Council. She breaks those numbers down, saying it's about 100 people killed on our roads a day, "the equivalent of two regional jets crashing, every day. That would be 14 plane crashes a week," she says. "If we had 14 plane crashes a week, our hair would be on fire and no one would set foot on an airplane," Hersman adds. "Why do we accept the fatalities that occur on our roadways?" So the nonprofit National Safety Council and the federal government are working with car and truck manufacturers on new vehicle safety features,such as automatic emergency braking, which will become standard on most vehicles by 2022, and with highway and traffic engineers on safer road designs. Though these advances will help, Rosekind says the biggest challenge is changing human behavior. New technologies will be able to override some mistakes people make, but not all. "The technology enthusiasm is just because that's a new tool," he says. "It's not an answer, either, it's just a new tool for us to use." As for self-driving cars, which may eventually help reduce or eliminate human error and mistakes people make behind the wheel, Rosekind notes that a high tech solution is still a long ways off. "As much as people talk about fully autonomous drivers, we gotta do stuff now," he says, to better protect the lives of tens of thousands of people dying on our roadways each year.